The CIA's post-war review faulted agency analysts for not looking at events in Iraq from the standpoint of "a paranoid dictatorship." Probably the best available intelligence on Iraqi thinking – not to mention Saddam Hussein's own attitudes – comes from what the deposed dictator himself told the FBI after his capture in December 2003. 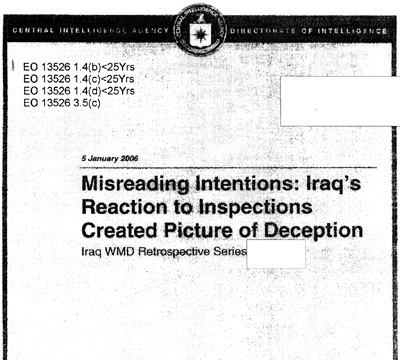 CIA, Directorate of Intelligence, "Misreading Intentions: Iraq's Reaction to Inspections Created Picture of Deception", Secret, January 5, 2006.